Saugat Sen: Peyton Silva has finally graduated last year, but unfortunately for the Orange, the Cardinals bring another talented class into the Dome on Wednesday. Coming off a shocking loss at home to NC State, the Cardinals will certainly not want to drop two in a row. No surprise that a Rick Pitino team is tops in the ACC in team defense: First in steals and blocks, and second in rebounds. To top it off, they have a star that can equalize Rakeem Christmas. Montrezl Harrell is a beast averaging nearly a double double a game. Expect him to give Christmas as much trouble as Jahlil Okafor did on Saturday. He plays with his heart on his sleeve and expect him to energize the Cardinals past the Orange. Louisville 72, Syracuse 65. Matt Dagostino: On Saturday, we learned that despite a postseason ban, the Orange is not just playing out the schedule. They took Duke the distance and fought hard looking for a signature win in what has become a lost season. Is that signature win coming Wednesday against Louisville? Probably not. The Cardinals are coming off an upset loss to a good NC State team on Saturday. In that game, Harrell and Terry Rozier combined for just 14 points on 4-for-16 shooting. On the season, those two combined to average 33 points per game. So, don’t look for a repeat performance. Harrell and Christmas should cancel each other out. Louisville, though, has a bevy of solid scorers, from Harrell to Rozier to Wayne Blackshear and Chris Jones. 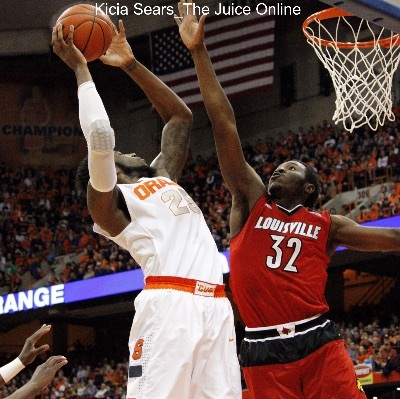 Syracuse will manage to stay close just like it did against Duke, but the offensive roster of Louisville may be just a little too much for the Orange to combat. Louisville 72, Syracuse 64. Wesley Cheng: Jim Boeheim has traditionally struggled against his former assistant coach, although you may not want to put that in a headline if you’re a member of the media. To be exact, since Pitino has been at Louisville, Syracuse is 3-9 against their former Big East rival. They’re meeting for the first time as members of the ACC, but don’t expect the the results to be much different. While freshman point guard Kaleb Joseph has limited his turnovers to just 2.0 per game over the last four games, he hasn’t seen anything quite like the relentless Louisville press. 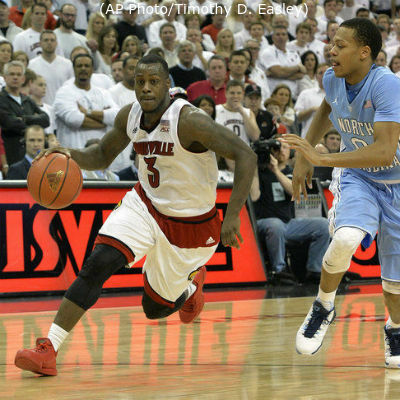 Still, the Cardinals not having senior guard Chris Jones should help keep this game close. 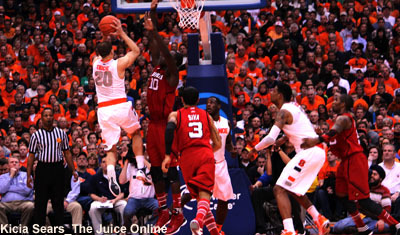 Louisville 65, Syracuse 60.